Expedia can help you save heaps with Lyon travel packages. With all that extra cash in the bank, you might even like to book a few more nights. Secure your deal on Expedia and gain savings of up to 15%*! It's that simple! Our extensive global database allows you to look through more than 321,000 properties worldwide and 400 partner airlines. With such a broad range of options, designing your dream holiday will be simple! If you have to change your holiday plans, we'll honour your cancellation request on nearly all bookings with no hidden fees. About to embark on your Lyon holiday? Not sure what to put on your travel schedule? No need to fret — we'll give you some suggestions. Boasting attractions like Lyon Opera and the Roman Theatres of Fourviere, you'll never have a dull moment in this metropolis. When you're done having a look at those, push on to the Eurexpo Lyon and Bellecour Square. Public squares tell many stories. Wander time-worn pathways and search for clues to the region's history at Terreaux Square. Travellers in this destination have a great range of options. If only these walls could talk! Imagine the power grabs and heated arguments that have happened at Lyon City Hall. Catch a tour and get a better look at this historically significant building. Still have time on your hands? Check for tours at St. Jean Cathedral. While you're there, take a moment to sit at one of the pews and say a quiet prayer. Experience everything there is to see and do and make your way home with the best souvenir of all — fond memories of your wonderful adventure! if you're looking for something fun to do, we recommend trying an Electric Bike Tour of Lyon. 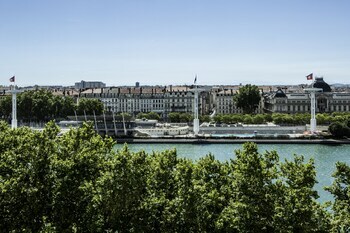 For a complete range of activities, head to our Lyon things to do page. Getting convenient places to stay is key when it comes to planning cheap holidays or luxury getaways. Luckily, Lyon has 186 accommodations, so you'll have plenty of choices. If you're someone that can't fall asleep unless they're lying on 1000 thread count sheets, why not nestle down in luxury at the Villa Florentine (25-27 Montée Saint Barthelemy) or the Cour des Loges (6 rue du Boeuf)? If you've done the math and these are out of your price range, don't fret — we've got some more economical options. 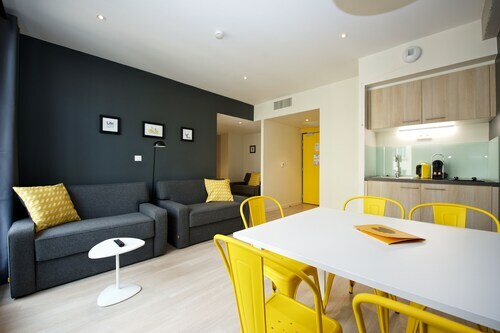 Have a look at the Le Gourguillon (46 montée Gourguillon) and the MiHotel (5 place Bellecour). Positioned just 6 miles (10 km) away, Lyon Bron Airport (LYN) is the most convenient terminal to your destination. Fasten your seat belt and make sure your seat is in the upright position — your wonderful trip to Lyon is about to begin! Join hordes of fans for a thrilling rugby match or an open-air concert at this Lyon stadium with a rich sporting history. Relax at a café in one of Europe’s largest open squares and enjoy the French ambiance generated by street performers and live music. Watch a performance or tour the interior of this unusual opera house, which dramatically combines traditional and modern architectural styles. Life unfolds in this beautiful and busy central square, home to a superb fountain sculpted by Statue of Liberty designer, Frédéric-Auguste Bartholdi. Take a guided tour of this fine example of neoclassical architecture to learn about the rich history of the French legal system. The symbol of Lyon and the seat of its government is a stunning 17th-century building with a history of swamps, fires and revolutions. See the remarkable 600-year-old astronomical clock that chimes in this long-standing religious monument. Complete your Lyon visit with several hours in this delightful spot, a combination of botanical gardens, grassy public spaces and a zoo. Lyon’s crowning glory, this monumental church stands atop Fourvière hill and provides fabulous panoramas of the city. Learn about the history of art by browsing up to 70 rooms full of creative treasures that come from varying time periods and genres. Visit this impressive complex, home to one of the oldest Roman theaters in France. 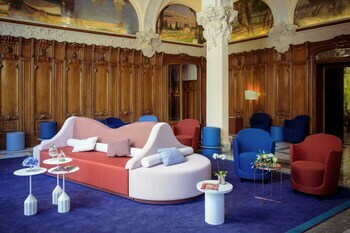 Enjoy a journey through the world of art, design and textiles in a beautifully laid-out museum hosted in an elegant Lyonnais mansion. Marvel at the exceptional Circus Mosaic that shows a rare four-horse chariot race as you peruse this fascinating collection of Roman artifacts. Located in Lyon City Centre, this romantic hotel is within 1 mi (2 km) of Part Dieu Mall and Bellecour Square. Tete d'Or Park and Basilica of Notre-Dame de Fourvière are also within 3 mi (5 km). Part-Dieu - Servient Tram Stop is only a 2-minute walk and Palais de Justice - Mairie du 3eme Tram Stop is 6 minutes. Located in Lyon City Centre, this hotel is within a 15-minute walk of Place Carnot, Lyon Confluence Shopping Center and Textile Museum. Centre d'Histoire de la Resistance et de la Deportation and Bellecour Square are also within 1 mi (2 km). Suchet Tram Stop is only a 2-minute walk and Lyon Perrache Station is 5 minutes. 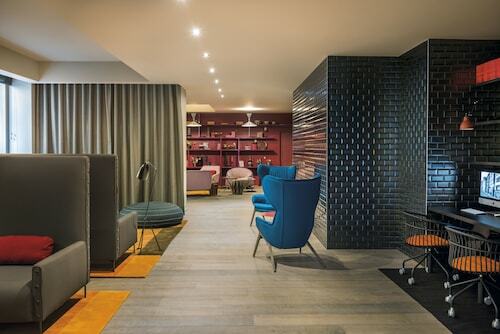 Located in Lyon City Centre, this hotel is within a 15-minute walk of Bellecour Square and Place des Jacobins. Lyon Opera and Basilica of Notre-Dame de Fourvière are also within 2 mi (3 km). Guillotiere Station and Guillotiere Tram Stop are within a 5-minute walk. 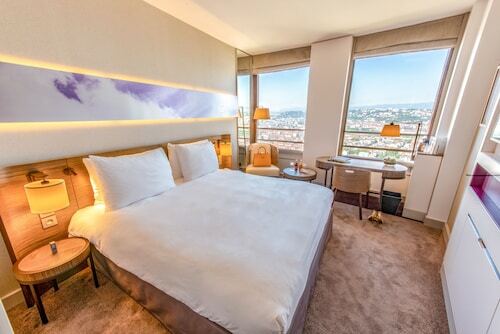 Located in Lyon City Centre, this hotel is within 1 mi (2 km) of Bellecour Square and Lyon Cathedral. Lyon City Hall (Hotel De Ville) and Lyon Museum of Fine Arts (Musee des Beaux Arts) are also within 2 mi (3 km). Saint-André Tram Stop is only a 2-minute walk and Rue de l'Universite Tram Stop is 2 minutes. 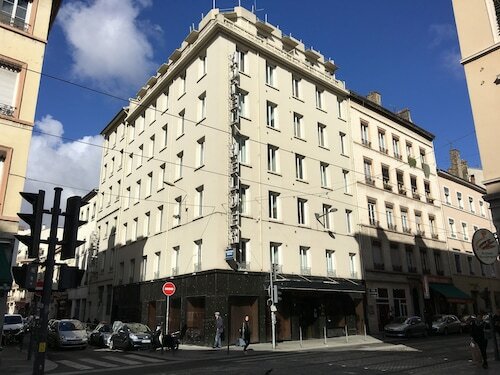 Located in Lyon City Centre, this residence is within 2 miles (3 km) of Centre d'Histoire de la Resistance et de la Deportation, Bellecour Square and Part Dieu Mall. Halle Tony Garnier and Lyon City Hall (Hotel De Ville) are also within 3 miles (5 km). Garibaldi - Berthelot Tram Stop is only a 4-minute walk and Route de Vienne Tram Stop is 7 minutes. Situated near the airport, this eco-friendly hotel is within 6 miles (10 km) of Eurexpo, Genas Karting and Genas Bowling. Groupama Stadium and Grand parc de Miribel-Jonage are also within 9 miles (15 km). Lyon Saint-Exupéry TGV Station is 10 minutes by foot and Lyon Saint-Exupery Airport Station is 10 minutes. 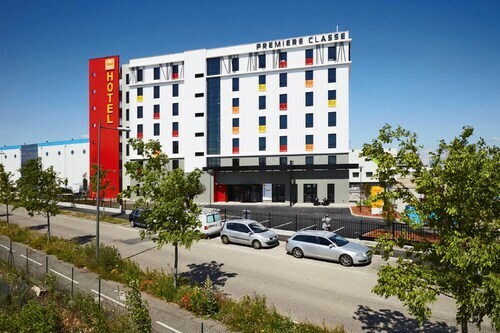 Situated in the business district, this hotel is 0.1 mi (0.1 km) from Eurexpo and 2 mi (3.2 km) from Eurexpo Lyon. Lyon-Chassieu Golf Club and Fort Bron are also within 3 miles (5 km). 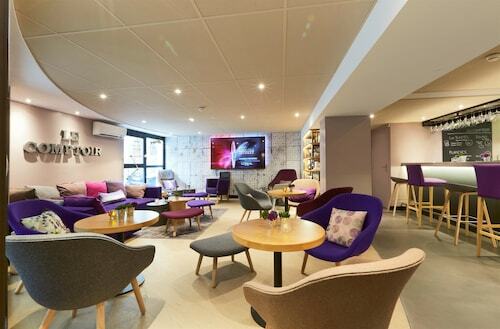 Located in Lyon City Centre, this hotel is within a 15-minute walk of Lyon Opera, Lyon City Hall (Hotel De Ville) and Terreaux Square (Place des Terreaux). Bellecour Square and Part Dieu Mall are also within 1 mile (2 km). Cordeliers Bourse Station is 8 minutes by foot and Liberte Tram Stop is 9 minutes.